A, B and D are actions we do in 3D in our 360° environment we live in. C however we do in 2D in small screens, like our smartphones. Yes, I know, VR and AR are up and coming. In the next few years we will go from a 2D / small screen computer-interaction towards a more 3D / 360° immersive one. And it’s about damn time, cause we haven’t been using computers intuitively at all. I’ve been designing digital products for over seven years now. I designed responsive, adaptive and mobile websites, mobile apps, webtools and since recently also AI related web projects. But I can’t help to think what a shame it is to still be designing for these temporary small 2D screens we all use on daily base. Of course, everyone has a smartphone, so we have to and it still makes a lot of sense. But using a small device with a 2D environment does not for a lot of applications. So computer-interaction will go towards 3D / 360° the next couple of years. I simply just can’t wait designing more intuitive user experiences. One in which we will use our hands in the space around us while interacting with the environment we’re in. So I started exploring and imagining the possibilities. I took an app we all have on our smartphones and we use a lot, and translated it into 3D / 360°. Is it like Minority Report irl? Yes, it’s exactly like Minority Report, but then in real life with real apps people actually use. So far I explored 1 app we are all familiar with: the camera app. And this is why I think it will work better in 3D / 360°. Imagine you’re wearing AR glasses (or lenses) and you click on the camera app on your smartphone (or you use your voice to launch it). A 140° app (UI) will appear. Look at all the space there is for all the different features this app has to offer! 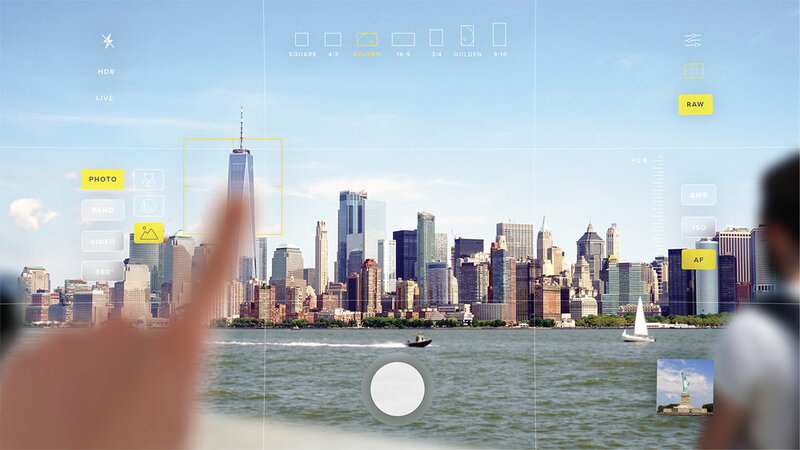 The space of the interface is huge and you can use your hands to click for the perfect settings in order to take the perfect shot. So you’re in New York taking the Staten Island ferry. You’ve just visited the Statue of Liberty and on your way back you want the perfect photo of the beautiful skyline of Manhattan. In this case you want this skyline sharp, so you click on one of the skyscrapers, like the One World Observatory. You can actually click on the buildings themselves right in front of you to make them sharp in the photo. You’re interacting with the environment you’re in, and not with a small UI on your smartphone. If you’re done with all the settings click the big round button or say ‘snap’ and your perfect photo is captured. Just two actions: 1) ‘tapping’ the building, and 2) saying ‘snap’ or ‘take photo’. In the future I will explore more possibilities for apps we all use a lot today and what the benefits will be in 3D / 360°. In the meanwhile you can also read an article I wrote about it on Medium.